Jose Mourinho says Manchester United should have scored six, seven or eight! 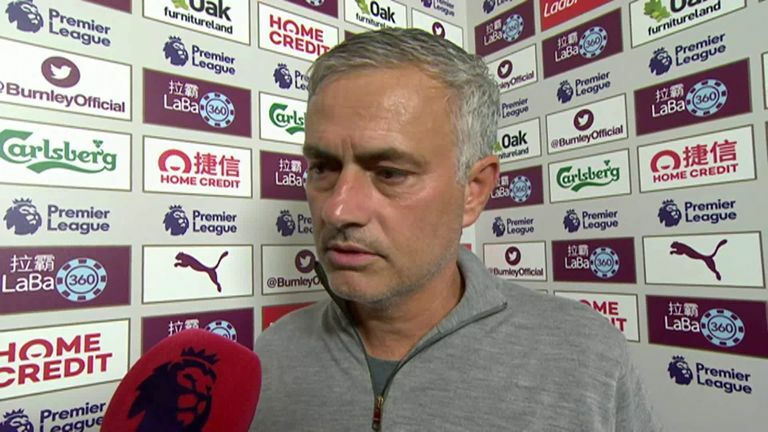 Jose Mourinho hailed the importance of the fans' reaction to the defeat to Tottenham after Manchester United got back on track against Burnley. Romelu Lukaku scored twice as United returned to winning ways with a 2-0 victory over the Clarets at Turf Moor. United were put on course for a routine victory when Lukaku headed them in front on 27 minutes and the Belgium striker doubled his tally with a close-range second a minute before half-time. The win comes after a turbulent start to the campaign under Mourinho, which included a 3-0 home defeat to Spurs on Monday Night Football. Mourinho was seen passionately clapping the home fans at the final whistle after that defeat by the north Londoners at Old Trafford, and he admitted that positive reaction from the crowd had had a huge effect on his team's mentality ahead of this important clash with Burnley. "The quality of the performance and the happiness within the team is Old Trafford's responsibility," he said. "The reaction after the game at Tottenham was fundamental to keep the team moving in the right direction." Paul Pogba missed a second-half penalty and Marcus Rashford was dismissed for a headbutt, but United saw out the win comfortably - lifting them to 10th in the table - to ease the pressure on Mourinho. The manager was delighted with the amount of chances his attack created, having registered a total of 21 shots in the game. "In the first 10 minutes we played so well that it reminded me of the Tottenham game because we were dominating opponents - but this time we scored," he said. "Should we score six, seven and eight? Yes we should. "But at least we scored two and the team was strong, defensively very good. Even with 10 men we were the team that had chances to score. We are very happy the boys can go on their international break with the feeling of a good result."